Volkmann, Inc. is a wholly owned subsidiary of Volkmann GmbH. Located conveniently off the 95 corridor in Bristol, PA, we serve customers throughout North America with vacuum conveying systems for contained product transfer, service and engineering support. We offer a fully equipped, 750 square foot dedicated test laboratory within our Pennsylvania facility where we have the ability to test all sizes of conveyors, and all but the very largest vacuum pumps, in house. The lab features our VS200, VS250, VS350 and VS450 receivers in addition to a variety of feed hoppers, including a rip and tip bag dump station, bulk bag unloader and Conweigh weighing system. To better simulate real world applications, the lab features two 150-foot runs of 1½” and 2½” conveying lines plus the ability to add a 20 foot vertical lift. Our clients can discuss what they are seeing in our lab conference area and also view a static display of our complete line of conveyors. Volkmann GmbH, located in Soest in Westphalia, Germany, was founded in 1973 by Jürgen and Ingrid Volkmann as a consulting company for production automation. Since 1991, second generation Thilo Volkmann heads the company that began by developing applications within vacuum technology, developing proprietary and patented processes such as the patented “Säuferbalken”® (combined vacuum stripping process for drying belt surfaces and for liquid recovery in mills) and the patented Multijector® (special construction form of a multi-stage ejector vacuum pump operated by compressed air). Such innovations have helped to position Volkmann as an industry leading partner, driven by ideas and application technologies for our customers. Today, Volkmann employs over 100 employees, operates subsidiaries in Great Britain, France and the USA and is internationally present in many countries with local agencies. Volkmann is known throughout the world as a specialist in the transport and handling of bulk materials. In particular, Volkmann offers customers within the chemical, food processing and pharmaceutical industries best-in-class engineering and manufacturing standards as well as individually planned and produced systems for the safe, hygienic and user-friendly handling of powders and bulk materials. Thanks to a professional and creative team, Volkmann consistently produces new and better solutions to meet customer needs – all of which are manufactured with the company’s modern machinery and lean manufacturing principles. VS350, VS250, VS200 conveyors within the Volkmann USA Pennsylvania test laboratory. 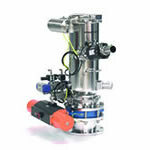 Prove the viability of pneumatic conveying for your application in our dedicated test facility.